At UCLA, Professor Calderon was founding Chair of the César E. Chávez Center (1994). He has also served as Director of the University of California, Education Abroad Program’s Mexico Study Center (2004-2008) and founding Executive Director of la Casa de la Universidad de California en México, A.C. (2006-2008). Prior to coming to UCLA in 1991, Calderón was Professor at Scripps College (1989-1991) and Associate Professor at Yale University (1983-1989). Professor Calderón has a Ph.D. in Latin American Literature with a Minor in Comparative Literature from Yale University (1981) where he studied with Peter Brooks, Alfred J. MacAdam and Emir Rodríguez Monegal . As a graduate student at Yale, he was accepted to The School of Criticism and Theory (1978) working with Wolfgang Iser and Fredric Jameson. He has been Visiting Scholar at the Stanford Humanities Center (1986-1987) and Visiting Professor in the Department of English at Harvard University (1996-1997). 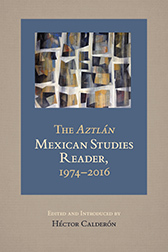 “Chicana and Chicano Literature,” Routledge Companion to Latino/a Studies, Forthcoming 2012. “From Chicano Studies to Mexican Studies, from Literature to Popular Culture: An Interview with Hector Calderon,” White Rabbit: English Studies in Latin America, Online Journal, 2012. “The Many Lives of Rolando Hinojosa,” Introduction to Rolando Hinojosa: Collected Essays, Houston: Arte Publico Press, 2011. “The Mexico City-Los Angeles Cultural Mosh Pits: Maldita Vecindad, a Chilanga-Chicana Rock Banda de Pueblo,” Aztlan 31.1 (2006). “Mexicana hasta el alma yo soy: Ely Guerra’s Fusion of Rock, Poetry, and Fin-de-Siecle Feminism,” Puentes: Revista Mexico-Chicana de Literatura, Cultura y Arte. Corpus Christi, Num. 2, Otono 2004. Bridget Kevane,”The Autobiographical Voice and the Making of the Self in Bernardo Vega, Sandra Cisneros, Rigoberta Menchú and El Inca Garcilaso de la Vega,” 1996. Professor of Spanish, Associate Dean of Faculty Affairs, College of Letters and Science, Director of Liberal Studies, Montana State University. Jeffrey Lamb, “Identities on the Margin: Perspectives on Sandra Cisneros, Rosina Conde, Luis Humberto Crossthwaite, and Alejandro Morales,” 1997. Professor of Spanish, Vice President of Instruction, Merritt College. Juanita Heredia, “Latina Writers in the United States: At the Borderlands of a Pan-American Boom,” 1998. Professor of Spanish, Global Languages and Cultures, Northern Arizona University. Sandra Perez-Linggi, “The Nuevomexicano Literary Tradition: From Spanish Conquest to Statehood,” 2002. Professor of Spanish, Modern Languages and Literatures, Director Honors Program, Cal State Fullerton. Ariel Tumbaga, “Yaqui Warrior Myth: Representations in Twentieth and Twenty-First Century Chicana/o and Mexican Cultural Productions and Literature,” 2009. Assistant Professor, Southern Oregon University. Oriel Maria Siu, “Novelas de la diaspora centroamericana y la colonialidad del poder: Hacia una aproximacion de-colonial al estudio de las literaturas centroamericanas,” 2012. Assistant Professor and Founding Director Latino/a Studies, University of Puget Sound. Carolyn Gonzalez, “Las Insometidas de la Ciudad de Mexico: The Novel of Prostitution in Antonia Mora, Sara Sefchovich, and Cristina Rivera Garza.” 2014. Assistant Professor of Spanish, Modern Languages, The College of Idaho. Sandra Ruiz, “Escrito con Tinta Roja: The Feminist Investigator in the Fiction of Maria Elvira Bermudez, Myriam Laurini, and Patricia Valladares.” 2014. Assistant Professor of Spanish, Founding Faculty for Latin American/Latino Studies and Social Justice Degree Programs, West Los Angeles College. Audrey Harris, “De lo más pobre y de los más lindo: Transnational Borges and Sandra Cisneros.” 2016. Assistant Adjunct Professor, UCLA, Spanish and Portuguese, 2016-2019. Alejandro Ramírez Méndez, “Trans-Urban Narratives: Literary Cartographies and Global Cities in the Urban Imagination of Mexico and the U.S.” 2018. Assistant Adjunct Professor, UCLA, Spanish and Portuguese, 2018-2019. Christian Yanaí Bermúdez-Castro, “Black Mexico’s Sites of Struggle across Borders: The Problem of the Color Line.” 2018. Lecturer, UCLA, Spanish and Portuguese, 2018-2019.